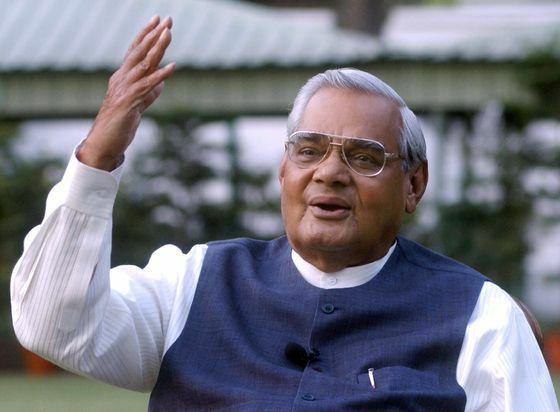 (Bloomberg) -- Atal Bihari Vajpayee, the former prime minister who transformed India into a nuclear-armed nation and ignited a weapons race in South Asia, died Thursday. The 93-year-old had been ailing for some time and on June 11 was admitted to the All India Institute of Medical Sciences suffering a range of illnesses, where his condition deteriorated. Known for his engaging speeches, Vajpayee led India’s right-wing coalition governments from 1998 to 2004, overseeing sweeping policy changes in telecommunications, education and privatization of state-run firms. He will be remembered for his repeated efforts at talks with neighbor Pakistan, improved relations with the U.S. and India’s second nuclear weapons test in 1998, more than two decades after the first detonation in 1974. Two months after his Bharatiya Janata Party-led coalition came to power, Vajpayee ordered detonation of three underground nuclear devices on May 11, 1998 at Pokhran in the northwestern state of Rajasthan. In defiance of a global outcry, two more tests were conducted at the same site two days later. The U.S. imposed economic sanctions, while some European nations and Japan halted aid. Pakistan responded with its own atomic blasts two weeks later, ignoring appeals from world leaders to show restraint. "The nuclear tests in 1998 were a watershed moment in India’s history," said Michael Kugelman, a senior associate for South Asia at the Woodrow Wilson Center in Washington. "They served as an early but resounding reminder of India’s status as a rising power. But the nuclear tests also set India and Pakistan on a new and escalatory collision course that they remain on today." Yet, Vajpayee’s involvement in efforts with Pakistan’s then President Pervez Musharraf to launch a dialog on Kashmir remains "one of the most promising, and only, true attempts to launch a formal peace process on the subcontinent," according to Kugelman. The son of a school teacher, Vajpayee was born in 1924 in Gwalior in the central state of Madhya Pradesh. A lifelong bachelor and amateur poet, he was a member of the Rashtriya Swayamsevak Sangh, the BJP’s parent organization. Vajpayee’s first taste of politics came in 1942 when he was arrested briefly for joining the Quit India Movement that hastened the end of British colonial rule five years later. "His passing away marks the end of an era," Prime Minister Narendra Modi said in a statement. "He lived for the nation and served it assiduously for decades." He worked as a journalist before joining the Bharatiya Jana Sangh, the fore-runner of the BJP, in 1951 and was elected to the lower house of parliament six years later. He was detained for a second time with other opposition leaders in 1975 when Prime Minister Indira Gandhi imposed a state of emergency and suspended elections and civil liberties. Once restrictions were lifted two years later, her Indian National Congress party suffered a heavy defeat at the polls. Vajpayee became foreign minister from 1977 to 1979 in the country’s first non-Congress government. As BJP president from 1980 to 1986, he worked with long-time colleague Lal Krishna Advani to build the party. The BJP later supported a campaign to build a Hindu temple on the site of an ancient mosque in the northern town of Ayodhya, eliciting votes of many Hindus, India’s majority religious group. Their efforts paid off with the BJP forming its first government in 1996. Vajpayee became prime minister but the administration lasted only for a fortnight. The BJP won subsequent elections in 1998 and 1999. Having long promised to carry out nuclear tests if elected, Vajpayee wasted no time. In an interview with India Today magazine days after the explosions, he declared India to be the newest member of the nuclear club. With the nuclear tests behind him, Vajpayee’s time in office was punctuated by crises and later peace moves with traditional rival Pakistan. He traveled to Pakistan for talks in February 1999, only for fighting to erupt two months later in the Kargil region of Kashmir as Indian soldiers sought to push back Pakistan-backed forces that had occupied Indian-controlled territory. A second effort to improve ties in 2001 ended in failure as talks with Musharraf collapsed. Tension flared again following a terrorist attack on India’s parliament in Delhi in December that India blamed on Islamic militants it said were supported by Pakistan’s security agencies. Talks began again in 2003. While the BJP lost the general election the following year to a resurgent Congress, the peace process survived until the attack on Mumbai in November 2008 by Lashkar-e-Taiba militants based in Pakistan. At home, Vajpayee further liberalized India’s economy by allowing foreign stakes in non-state-owned banks and insurance companies, and hastening state asset sales. He was criticized by opposition parties and human rights groups for not removing the then BJP chief minister of western Gujarat state, Narendra Modi, after riots in 2002 killed more than 1,000 people, mostly Muslims. India’s Supreme Court in 2009 ordered an inquiry into Modi’s actions during the rioting, which victims’ families have said he abetted. The Supreme Court ruled Modi -- who became prime minister in 2014 and will seek re-election next year -- had no case to answer. Vajpayee gradually retired from active politics after the BJP’s 2004 defeat, restricting his role to backroom guidance and writing cryptic poems. His adopted daughter cared for him in his senior years. In 2014, Modi’s government declared his birthday would be celebrated as ‘Good Governance Day.’ In 2015, he was given India’s highest civilian honor ‘Bharat Ratna,’ which means Gem of India.